Important Update for 2018: WP Curve Was sold to GoDaddy and rebranded as WP Premium Support. After going through the transition from WP Curve to WP Premium Support by GoDaddy, I have to revise my review and I can no longer recommend this service at this point. I have added my most recent review of the service first, and my original review can be seen below. I now recommend WP Buffs who I’ve been using for a few months and found their service the perfect replacement. Check them out here. Also see review at end of this article. WP Curve was an amazing service, as you can read below in my original review how much I valued it. It blew me away. WP Curve was sold to GoDaddy, and I had high hopes that the quality would continue with the transition. GoDaddy has improved over the years and gone through a transition. It shed it’s elephant-killing founder ways and became a progressive company with a much better track record. Unfortunately, my experience with the new WP Premium Support by GoDaddy has not been great. After a very confusing setup period, and a weird on-boarding I was met with no outreach from their team while they billed our account. We were previously on a proactive plan, and assumed the transition would have a similar setup as they assured us, but we received no communication from their team. After finally requesting a task from their team, we were also met with silence. Only when I reached out to the product manager on Twitter did I finally get some sort of response. Yet over a week and a half later, I have not response. I’ll be updating this review if things get better, but at this point I’ll be looking out for better WordPress support plans. 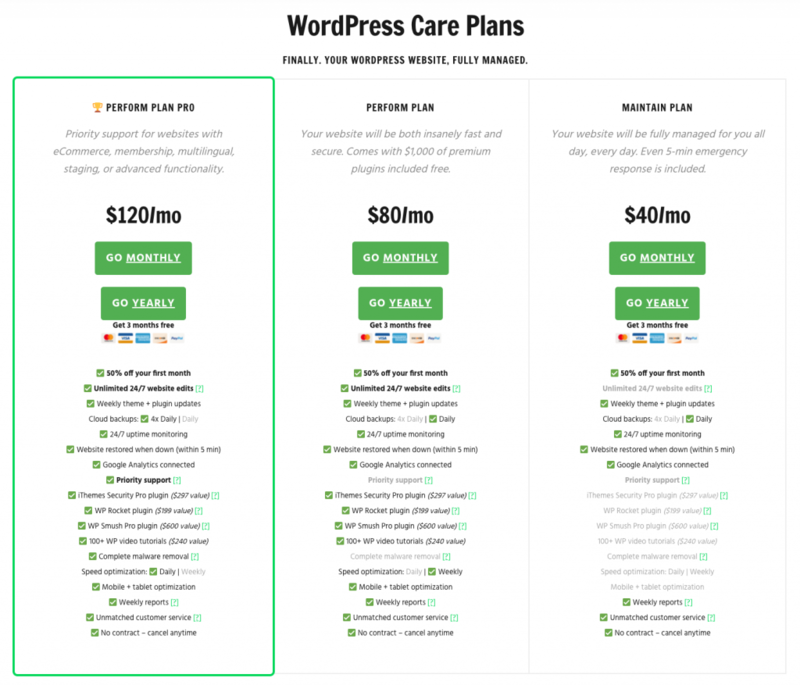 I cannot recommend WP Premium Support by Godaddy. This original review was published July 22, 2014. 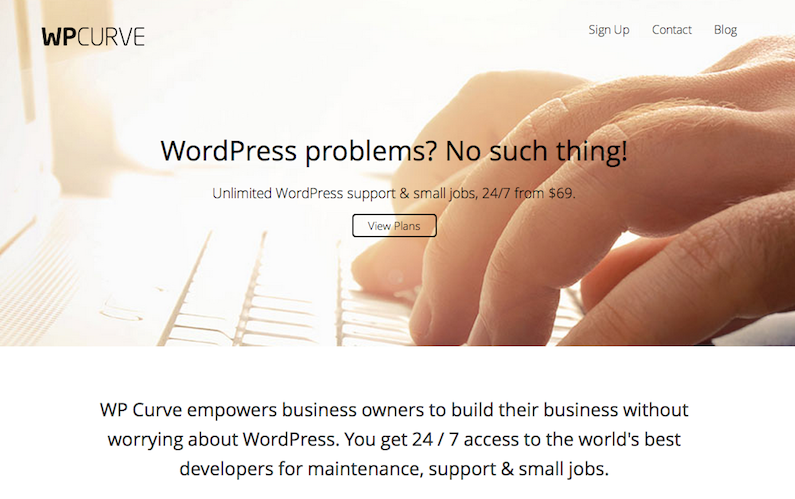 I recently did a piece comparing WordPress maintenance companies and I’ve always been fascinated by the space. It’s only grown up in the last few years and a few companies have sprung up around it. I’m not sure about the statistics and growth about the industry, but it seems to be solving a very real problem out there. Many, many small business owners don’t know how to get help with their WordPress website and at the same time don’t have the time or funds to hire their own developers. They also don’t know who to trust. By building brands around their services, I feel that these companies are fulfilling a real gap in the industry that existed a few years ago. One that I’ve especially been fascinated with is WP Curve. It seems almost too good to be true – you get unlimited small tasks (under 30 minutes) in one month for $69/month per site. I’ve only been using this service for a few days, and so far I’m impressed. The way I work, and I’m sure many people do, is I set out to do a task and if I don’t 100% know how to do it, I have to research it. Upon research, however, I find myself going down the rabbit hole reading up and down a bunch of articles trying to find the perfect way to do something. With WP Curve, I simply tell them what my problem is and they have the expertise of doing it hundreds of times that they just get it done. In the long run I should learn all of what they’re doing on my own, but I have to prioritize what’s most important now. And learning everything they can do in five minutes would take me at least an hour to learn per task. Although I’m a customer of theirs, I feel like they’re an employee of mine that I can outsource the work too that I don’t know how to do, I don’t have time to do, or I hate doing. More than anything though, is the fact that the more I can give them, the more I can focus on larger projects and tasks that I can’t give to anyone else. There are several well-known WordPress maintenance companies and all of them are a bit different – which is good. 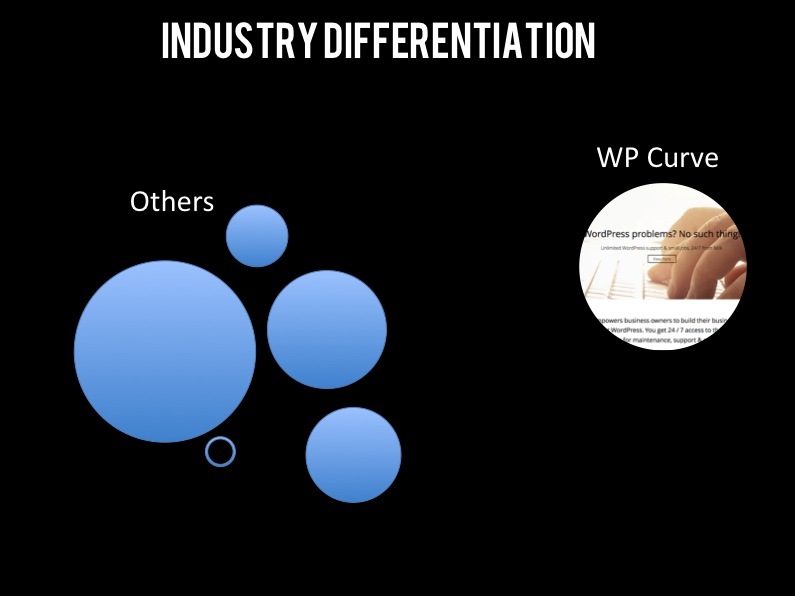 WP Curve is more different though than the rest of them. If you were to plot them out on a chart they would be an outlier. They do all the normal things that the other companies do – backups, security, plugin upgrades, but that’s not what they make prominent. What they make prominent is that they can do unlimited tasks for you per month. None of the other major companies are offering anything like this currently, which means they virtually own that space. They say if something sounds too good to be true, it probably is. In this case, I would say the offer is getting close to the level of too good to be true, but logically with the right business efficiency plan and taking advantage of good developers internationally, I could see how the financials work out. For me, and presumably many others, the idea of unlimited tasks in a month at the two prices they have listed ($69 & $99) is an irresistible offer. If they can do just one task in 30 minutes that would have taken me an hour to research and implement, I’ve already saved money. Do this multiple times in a month and it’s impossible to say no. They’ve also made their monthly subscription even more irresistible when you realize that you can get unlimited 30-minute tasks for $69 a month, or a one-time task for $69. Makes the subscription a no-brainer. I assume that, like me, business owners or their developers see these WordPress maintenance companies a few times before they finally act and make the purchase. I’ve been aware of these for probably two year but never had that final push to become a subscriber. They one of the sites I maintain got hacked. I didn’t really know what to do right off the bat and my time was ticking before I could potentially be blacklisted by Google. I know with certainty that I could have researched the problem and fixed it – but I also know that would have taken hours. I pulled the trigger on WP Curve and hopped on their Olark chat and their developer fixed the problem exactly within seven minutes. I was amazed at how fast it happened. The business lesson here is that I came with a major problem and they addressed that right away. Everything else can be fixed in due time, but that was urgent. WP Curve doesn’t have an admin and ticket tracking system currently in place. They could probably build it, and maybe they are, but that might distract them from growing their customer base first. Right now they’re using email and Olark chat to solve issues. While I would prefer an admin area and ticket tracking showing the progress of tasks, that’s not the most important thing. The most important thing is that my projects are completed fast, accurately, and safely. The second most important thing is that I have the flexibility to get more projects completed through them, which I do. Just as important as the last two is that the price is right – and it is. The three above items get me 85% of the way there. They could have spent extra time building an admin and ticketing system, but email and chat is working just fine for now. I’m not 100% convinced that this is a hard and fast business rule. If you don’t explain your service well enough, you might be losing out on customers. In the case of WP Curve however, their first day they provided a quick site audit with a list of recommended fixes. I noticed now that they have a line on their home page about providing this, but I didn’t realize this and was pleasantly surprised when I got the list within 24 hours. They said on their home page that most jobs are fixed within 6 hours. My first urgent hacked site project was fixed within 7 minutes. That’s an over-delivery when I was in the most pain. As mentioned earlier, the admin and ticketing system isn’t a deal breaker for me or for most people I’m sure, but it was one thing I’m surprised they didn’t have. For customers that are taking advantage of their promise of unlimited tasks, this could be a big one. I didn’t notice their line about proactively sending a list of things to fix. I think for small business owners that are not developers, this would be a big selling point. They should consider making that a prominent feature and saying something like “We give you new ideas every month to make your site better.” With phrasing like this, it makes them feel like a part time employee of mine. I’m not sure if the economics would work out for them, but I would love to see a 3 or 5 site monthly package at a discounted rate. I would think it’s safe to say that I might have one site that would need more work than the average every month, but three sites that need less than the average. Like the insurance industry they could offer a discount if they’re spreading the risk. I’ve only been a subscriber for a short period of time, but I’m very happy with WP Curve and have unexpectedly learned a few business principles that I hope to apply well to future projects. I’ve only been using WP Buffs for a few months, but I’m loving their service so far. They have a hybrid US/international support team that responds super fast and is ready to help. They’ve fixed several pesky issues for me so far that would have taken precious time out of my day to fix. They aren’t necessarily a replacement for a dedicated developer, and they have restrictions on what they’ll do, but if you’re looking for quick fixes for small issues, they’re the way to go. It’s tough to find great WordPress maintenance help that won’t be sub-par or cost an arm and a leg. I highly recommend WP Buffs as of 2018! Hey Joseph wow mate this is awesome thank you. I’m not sure if you are familiar with our content but we also share lots of business related stuff up on our blog http://wpcurve.com/blog/ we do monthly reports and we are very transparent about how we are building the business. I have a free book coming out soon with my main lessons, I cover a lot of your points above http://wpcurve.com/7daystartup. Also just to respond to a few of your points. We actually do have one, but just not one that customers can log into. We use HelpScout. We occasionally get asked for a system that customers can log into but out of 350 or so customers it’s only happened a handful of times. I think most customers just want their problems solved. We will build something eventually though and we are working a fully custom internal system for managing our particular processes in a better way than we can with off the shelf tools. We ran for the first 6 months or so without even having a help system, just Gmail. The proactive suggestions was introduced as a way to boost retention. I feel like it wouldn’t be a big selling point, I think people come to us when they have problems and want them solved quickly. But it seems effective as a retention effort and also it’s a bit of under promise over deliver as well. The multi site discount thing is tricky. It doesn’t really save us much money for someone to sign up with more than 1 site and my co-founder Alex gets nauseas whenever I mention the D word (discounting). I’ll keep working on him though. Thanks again for your review mate. Thanks again for the great service Dan – yes I’ve read a bunch of your blog writing and I especially love the transparency. I do agree the ticketing system is probably something that 80% of people don’t need, but the more development minded customers or agencies using your service would prefer that more than average customers I imagine. I can see how the proactive suggestions would definitely help with retention. I could still see it as a selling point. I might think my site is humming along just fine but if you guys offer a quick audit up front, then that could uncover problems I didn’t know I had – which would encourage me to sign up.